Gray hair in older persons is quite common and usually associates with natural process of aging but graying of hair in children or teenage boys/girls is less common but little bit more annoying. Premature gray hair not only causes a lot of embarrassment but also give them premature aged look. If your child is also getting premature gray hair then the first thing you must do, is to diagnose the exact cause for early graying of hair in your child. Let's have a look on some common causes behind premature or early graying of hair. 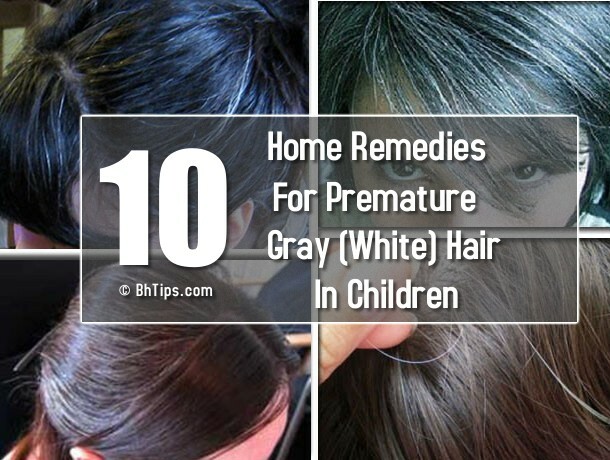 If your child's early graying of hair is not associate with a complex medical condition and caused just due to some nutritional deficiencies then you can cure this problem simply by following some natural home remedies which are given below. Amla is a rich source of Vitamin C and antioxidants that helps a lot to reverse the process of graying of hair. Coconut oil not only deeply moisturize your hair but also stimulate the growth of hair and aids in getting rid of premature gray hair in children as well as in adults. Boil a few Amla (Gooseberry) pieces in coconut oil till they turn black. Store the amla coconut oil in glass bottle. Take some oil, according to your hair length. Apply this oil mixture on your hair and scalp. Massage well on your scalp and make sure you apply the oil from roots to tip. To cure premature graying of hair naturally at home, repeat this process at least twice a week. Amla juice contains lots of anti-aging benefits and helps a lot to cure the problem of premature gray hair. Almond oil is a rich source of vitamin E that not only helps to remove premature wrinkles, fine lines and age spots but also helps in reversing the process of premature greying of hair. A mixture of amla juice and almond oil when massage on scalp also helps a lot to get rid of premature graying of hair. For best results apply this on a daily basis. Curry leaves are very beneficial in restoring natural black color of hair.When the leaves are boiled in coconut oil, the oil forms an excellent hair tonic to stimulate hair growth and bring back hair pigmentation. To prepare this hair tonic you need to follow the given instructions. Heat some Coconut oil and add curry leaves to it. Stop when the curry leaves turns black, turn off the stove. Apply on the scalp after it cools down, leave it overnight. This oil acts as a good stimulant and prevents greying of hair. Massage your child's scalp and hair with butter made from cow milk. Let it stay on your hair and scalp at least for one hour and then rinse the butter out of your hair thoroughly to avoid greasiness. Cow's milk butter contains enzymes to keep your hair well nourished and prevents the black hair pigment from disappearing. For best results, repeat this process at least twice per week. Make sure your child is getting all essential nutrients and minerals required for proper growth and nourishment of hair. To cure premature graying of hair, make sure your child is getting enough amount of B Vitamins. Deficiencies in folic acid(Vitamin B9) and biotin(Vitamin B7) can directly cause gray hair. Vitamins B-6 and B12 are vital to the production of red blood cells, which is how oxygen and nutrients are transported to your scalp. Vitamin B-2 assists hormone production and balance body systems that affect hair color. Foods rich in B vitamins include dairy products, whole grain breads, cereals, chicken, turkey, meat, eggs and green leafy vegetables. Vitamin A is necessary for promoting a healthy scalp and hair growth.Good Sources of vitamin A are dark green vegetables , yellow fruits and vegetables such as broccoli spinach, turnip greens, carrots, squash, sweet potatoes, pumpkin, and apricots, and in animal sources such as liver, milk, butter, cheese, and whole eggs. Minerals like zinc, iron & copper promote healthy hair. Natural food sources of zinc are red meat, chicken & green vegetables.Iron is found in beef, dried apricots, red meat, parsley, eggs, wheat and sunflower seeds. Copper is found in seafood, egg yolk, whole grains, sunflower seeds, cashews, lentils, almonds, turnip greens and spinach. Make sure your child get enough amount of Iodine which is also essential for proper hair growth. Best Sources of iodine are banana, carrots, onions, egg yolks, fish, yogurt and iodine fortified salt or iodized salt. Protein is required for the production of melanin, the pigment that provides black color to your hair and skin. To prevent grey hair, eat plenty of protein rich foods such as turkey, chicken, eggs, cereals, and soy. Drinking yogurt (Dahi) daily with a tablespoon of yeast can be beneficial in the treatment of premature graying of hair. For best and quick results, repeat this process on a daily basis. (i) Avoid hot water bath because hot water may damage the structure of melanocytes(black pigment producing cells). (ii) Avoid excessive sun bask. Over exposure to UV Sun rays may cause premature graying of hair. (iii)Avoid plucking of gray(white) hair. (iv) Avoid excessive intake of Iodine because heavy intake of iodine adversely affect thyroid gland and may cause premature greying of hair. (v) If your child doesn't get rid of premature graying hair even after following above remedies, then you must consult your problem with Doctor.